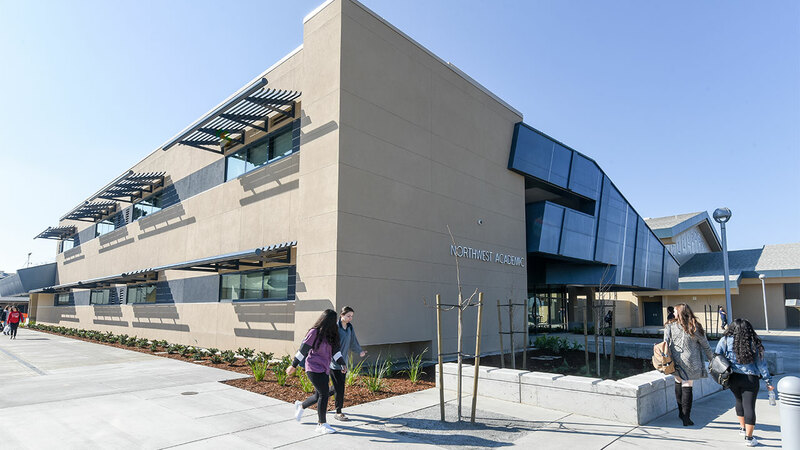 The transformation at Bullard High School continues, with the Northwest Academic Building opening its doors for the first time to students and staff Feb. 14. The building features 15 classrooms. Most house social science classes, with three larger rooms devoted to career technical education (CTE). The CTE rooms are designed with more open space for larger tables to foster collaboration among students. The project also includes a small garden and fountain north of the cafeteria as well as an outdoor workout space with artificial turf adjacent to the existing weight room. The building is part of the district's robust campaign to ensure quality facilities in support of quality instruction. It is one of the final projects using Measure Q funds. The Northwest Academic Building is part of a major construction project underway at Bullard High that began with the completion of the Southwest Academic Building in January 2016. With construction of the two new classroom buildings the school was able to eliminate 30 portable classrooms. With the Northwest Academic Building done, construction crews will focus on opening Bullard's new administration building and expanded library media center that includes a 100-seat lecture hall. That phase will feature a new entrance with raised relief mascot sculpture and signage that will create a clean, contemporary entrance directly at the front of the school on Palm Avenue. That phase is expected to be completed by June. With the district concluding projects funded by Measure Q (approved by voters in 2010) and Measure K (approved by voters in 2001), plans are already underway to build on the work with Measure X. Voters approved $225 million Measure X on Nov. 8. Cafeteria air conditioning: Centennial, Del Mar, Ericson, Fremont, Gibson, Holland, Jackson, Manchester, Phoenix, Powers, Pyle, Roeding, Starr, Thomas, Vinland, and Wishon elementary schools; Baird, Computech, Cooper, Fort Miller, Scandinavian, Tenaya, Tioga, Wawona, and Yosemite middle schools; and Roosevelt High School. New classroom buildings to replace portables: Bullard TALENT K-8 School and Columbia, King, Hidalgo, Homan, Leavenworth and Norseman elementary schools. Classroom modernization: Anthony, Balderas, Hidalgo, Leavenworth and Storey elementary schools and Rata School. Building infrastructure projects: Upgrades to electrical systems at Burroughs Elementary School, Baird, Cooper and Tioga middle schools and Hoover, McLane and Roosevelt high schools; new gym lockers/bleachers at Ahwahnee, Kings Canyon, Scandinavian, Tehipite and Yosemite middle schools and Duncan, Fresno and Hoover high schools; plumbing improvements at Addams and Thomas elementary schools, Hamilton K-8 School, Wawona Middle School and Roosevelt High School; and cooling and heating upgrades at Birney, Malloch and Mayfair elementary schools, Computech, Cooper, Fort Miller and Kings Canyon middle schools and Hoover, McLane and Sunnyside high schools. Bullard -- Renovated or rebuilt south gym. Duncan -- New and renovated career technical education classrooms, expanded ROTC facility, renovated library. Edison -- New theater, new second gym, renovated/expanded existing gym. Fresno -- Renovated academic and IB/CTE buildings, new second gym, renovated cafeteria. Hoover -- New theater, renovated library, renovated/expanded administrative offices. McLane -- New theater and second gym. Roosevelt -- Renovated cafeteria, renovated library, new second gym. Sunnyside -- Renovated theater/music complex, renovated CTE labs, security upgrades. Project recommendations may change based on availability of local and state funds, site conditions, enrollment, program needs, building system assessments, and other district priorities. For more potential Measure X projects, go to www.fresnounified.org.